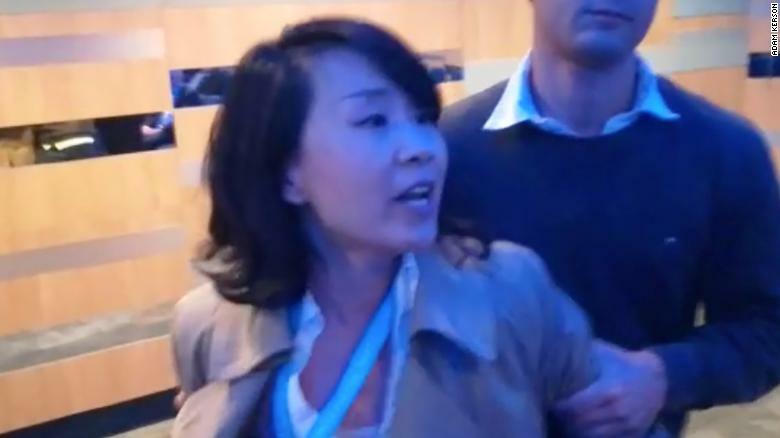 (TibetanReview.net, Nov23, 2018) – The United Kingdom has succumbed to pressure from Beijing to drop assault charges against a China Central Television (CCTV) reporter who had repeatedly slapped a volunteer for asking her to leave when she shouted to disrupt a fringe event of the ruling Conservative Party conference on Sep 30. The targets of her anger were democracy activists from Hong Kong who spoke at the fringe event conference. China had demanded apology from the UK for showing the door to Kong Linlin, the CCTV reporter. West Midlands Police had charged Kong with common assault, but the UK’s Crown Prosecution Service (CPS) has now said it had dropped the charges, reported the Mandarin and Cantonese Services of rfa.org Nov 21. “The CPS … reviewed the available evidence and determined it was insufficient to provide a realistic prospect of conviction and therefore discontinued the case,” the report quoted spokeswoman for the CPS as saying in a statement. However, the report pointed out that the CPS decision had come after CCTV claimed last month that charges against Kong had been dropped “due to diplomatic pressure”. The report cited a spokesman for the Chinese Embassy in London as having also called for the event organizers to apologize to Kong, 48, adding that the Chinese Communist Party strongly objected to the content of the panel which was discussing democracy and eroding freedoms since the handover of Hong Kong to China in 1997. That panel included Hong Kong pro-democracy politicians Nathan Law, Martin Lee, and Hong Kong University law lecturer Benny Tai, one of the founders of the 2014 pro-democracy Umbrella Movement, who has been lambasted by China’s official media for discussing the concept of independence for the city in public.